It seems that one of my kind, a search and rescue dog named Gandalf is a hero today. Gandalf was able to find a 12 year old boy scout who had been lost in the woods of North Carolina for 4 days. I know it is not the end of the year yet but I would like to take time out and present Gandalf with a Stephen award. I love it when we dogs can come through and prove to you humans our value. I would like to point out that in all the media coverage of this event there are lots of pictures of the searchers and of Michael but none of Gandalf. Without Gandalf and the other dedicated search and rescue dogs who worked this scene the outcome might not have been as positive. I say throw up a picture of Gandalf, he is not getting paid lets give him a little publicity. Let him have his 15 min of fame. Note the picture is not of Gandalf I could not find one of him but if someone sends me one I will update the site with his picture. I am sending out a huge high five to Gandalf. Nice work! 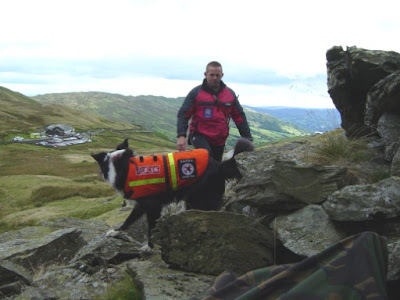 It takes a ton of time and dedication to become a search and rescue dog. My A and I actually looked into it and believe me it is a long hard road. We decided not to do it because there really was not a group around here we could join for the training and to do it on our own seems too daunting of a task. I firmly believe that search and rescue dogs should be paid a stipend. I am not saying they need to make a huge amount of money but I think working dogs should be paid. Give them the money and let them decide what to do with it. I hear there is a great idea out there just looking for investors, ever hear of Nut Silo.